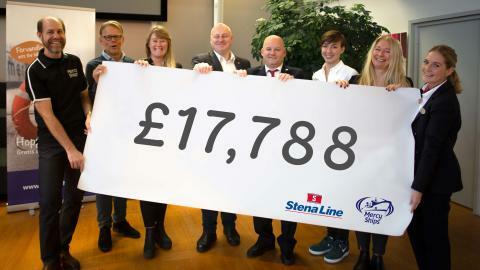 During the month-long, fleet-wide donation campaign, Round Up for Charity, Stena Line and its customers raised an impressive £17,788 for the charity organisation Mercy Ships. The funds will enable Mercy Ship to help 133 people to get their sight back on board the hospital ship Africa Mercy. Stena Line’s customers donated £15,604, beating the result from last year’s donation campaign which ran for twice as long. With the additional contribution from Stena Line, rounding up as well, the total amount of £17,788 will enable Mercy Ships help 133 people to get their sight back on board the hospital ship Africa Mercy. “Because everyone on board Africa Mercy is there on a volunteer basis, we have managed to reduce the cost of an eye surgery to approximately £134. We are grateful so many of Stena Line’s customers chose to support our work and by doing so this has helped to change many lives. It has also been great to see the enthusiasm and engagement among the employees at Stena Line during the campaign,” said Tomas Fransson, National Director for Mercy Ships Sweden.